Who doesn’t like a good beach on a hot summer day. If you have been reading our BLOG, you know that Italian beaches have clubs that give you a chase lounge or two, table and umbrella. They have great food service or you can bring your own, You can also go to nearby stores to get a pizza or panini. They serve all kinds of drinks right on the beach. A prosecco in a glass on the beach is divine! 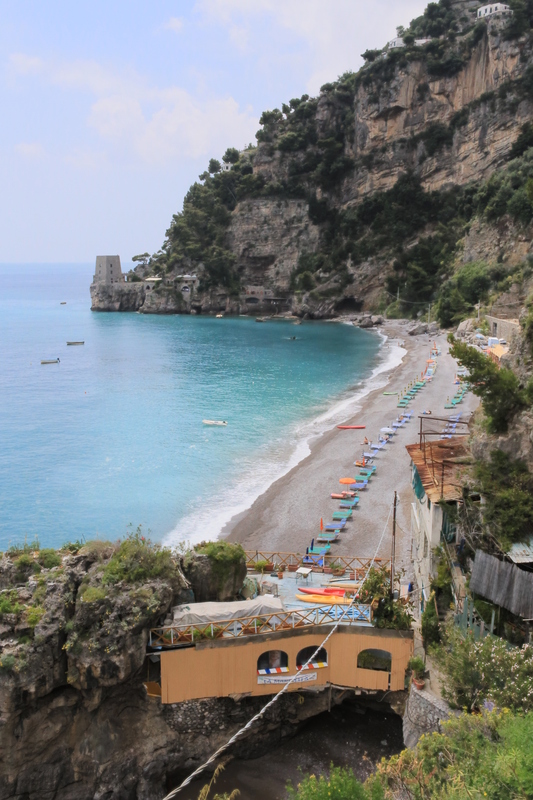 There are many different types of beach in Southern Italy. Some with lava stone, small rocks or sand. All of these beaches are awarded the much coveted Blue Flag status. 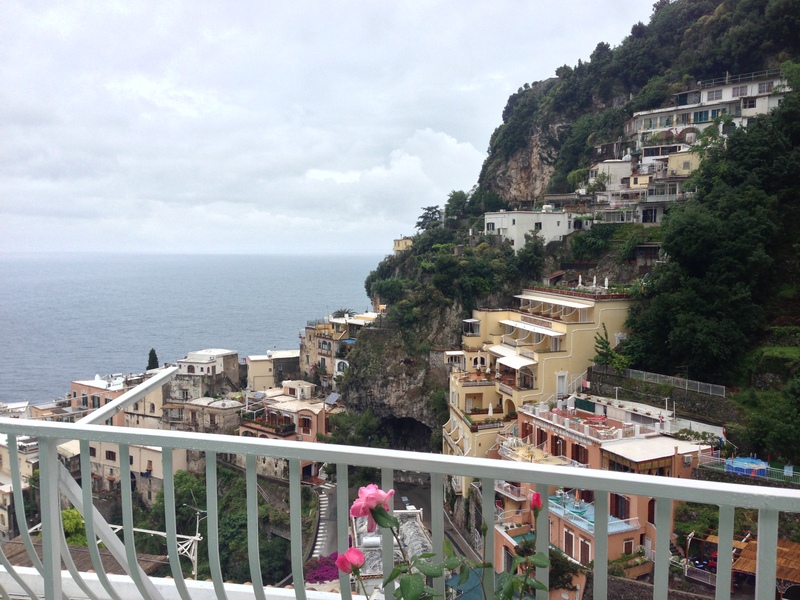 Amalfi Coast – There are numerous small towns along the stretch from Positano to Salerno. Each may be on a beach or high above with stairs down. Some beaches are reachable only by boat. These beaches tend to be lava rock but the water is great. Pack a lunch and enjoy them. 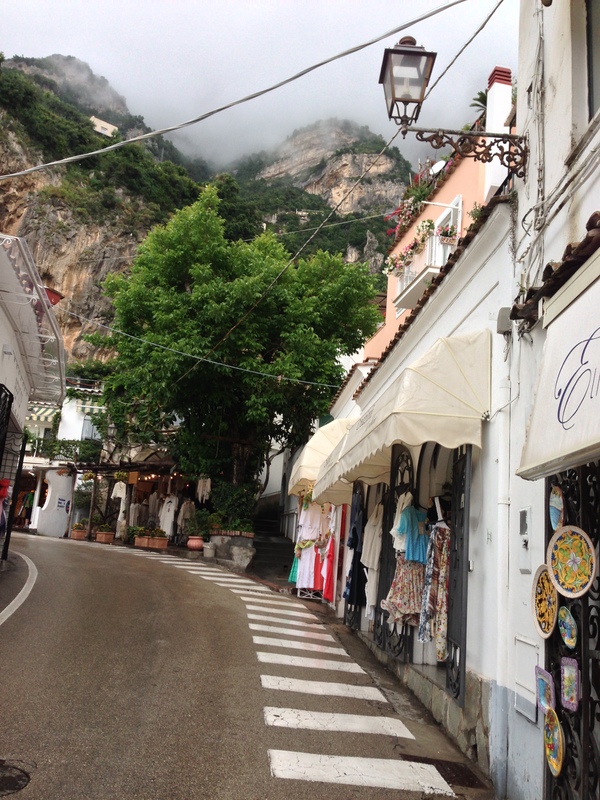 Capri – This island has two main beaches but they are small and heavy in boat and ferry traffic. Capri may not have the best beaches to relax on but is well worth a visit. 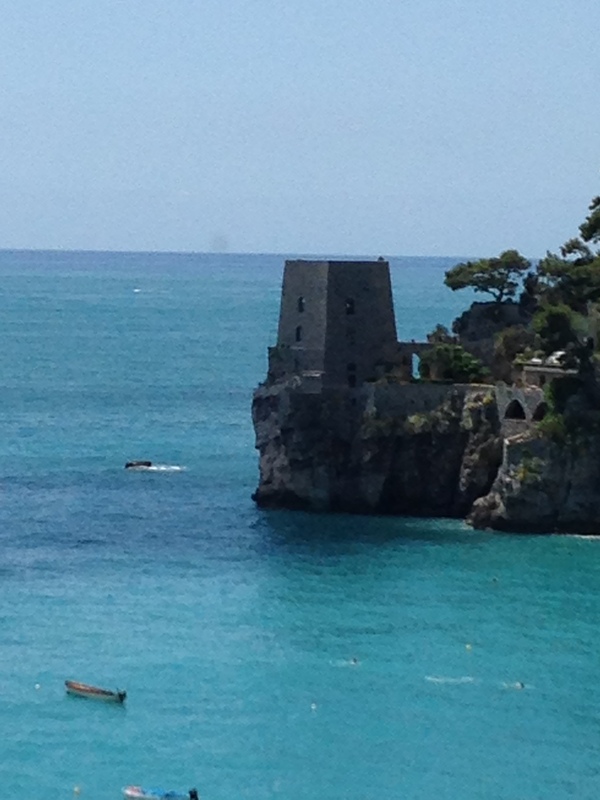 Agropoli – has wonderful beaches and great for boating. This is a major town with an old section high up and worth exploring. The high-speed train stops here. Santa Maria Castellabate – This is a wonderful seaside town with small but nice beaches and a great promenade. 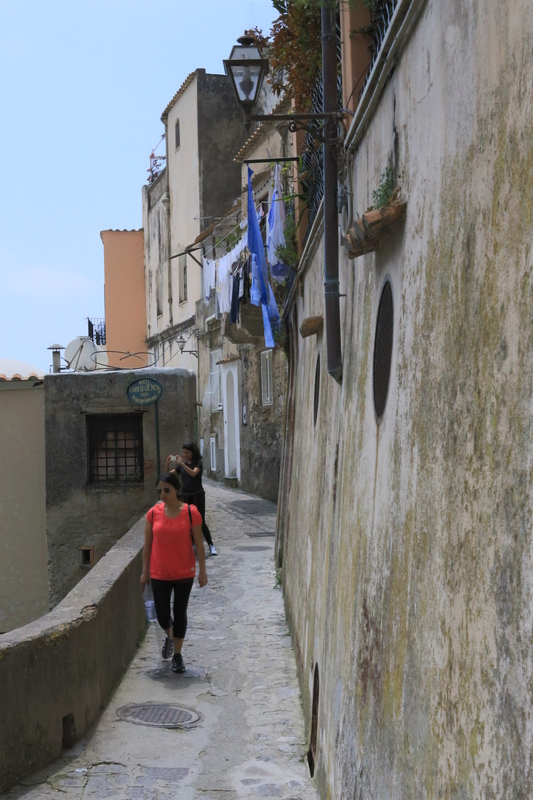 There is the old mountain town of Castellabate high above and waiting to be explored. Casal Velino Marina – This is our beach town. It can get very crowded in August. The beach is wonderful sand. The waves are non-existent in the summer which makes it idea to swim and for small children. The beach clubs are wonderful. Friday is market day and an entire street is closed to an open air market. Ascea – We often go to this beach town as well. The sand has small pebbles but it is soft. There are beautiful rocks along the waterline. There are also great clubs here. Thursday is the market day and worth a visit. It is located on the road that parallels the beach. There is a train stop in this town. Sapri – Is a small town with a high-speed train stop along the sea. It is a cove with beaches and a great promenade. Many of these towns have ferry services or small boats that can take you to other towns. You have so many choices in this part of Campania and it is home to the world-famous Mozzarella di Bufala. Have breakfast in a bar by the sea, have lunch in a restaurant or get a panini at a bar. There are so many choices of restaurants for dinner. This is paradise for both the beach goers and the explorers. Enjoy! Tour – This is our least favorite and we never do this. Tours tend to be big, slow moving and they choose restaurants that give them a kick-back (not ones with great Italian food). Tours have had complaints for a long time. Some are giving Free Days where you are on your own to explore. They do handle the issues of language, getting lost and easy of touring but at an expense. In our opinion a great expense. Rental Car – This is our favorite to go to small towns and hilltop cities. In large cities we park for the duration of our stay and walk or take local transportation. Car rentals are easiest at the airport. You get your car and drive out and are on an autostrada quickly. In the south where we have our home, it is critical to have a car. It is the country and you need a car to get around. Italy’s roads are easy to navigate and GPS works great. You have a choice of American car rentals like Hertz, Avis and Budget as well as European (usually cheaper) like Eurocar. The Autostrada has great Auto Grille (rest Areas) with good bathrooms, great food and gifts. Take a break from driving and enjoy. Cruises – This is an option we do not like. Cruise tours are short and not enough time to really see a city. A few hours in Rome is not enough to see it. It certainly is not enough time to sit at a bar and experience Italian life. 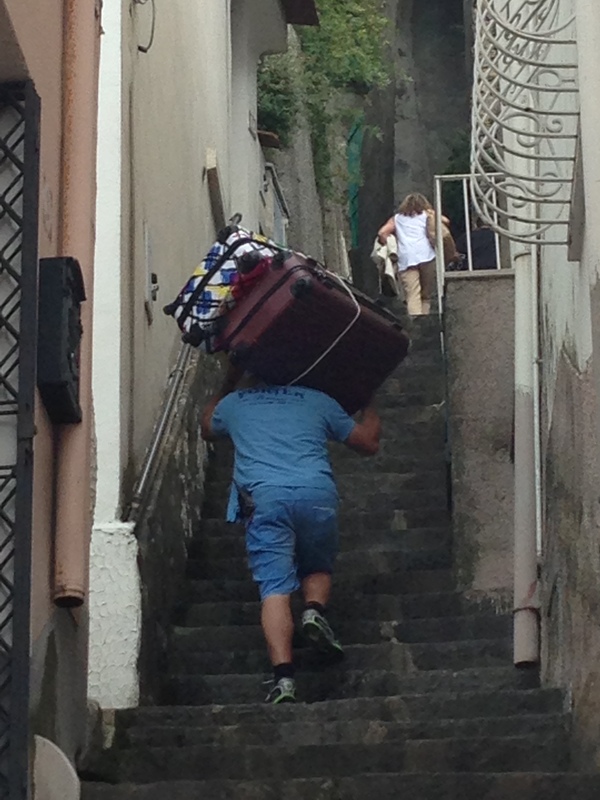 You go to Italy not just for the sites but to experience the Italian people and customs. 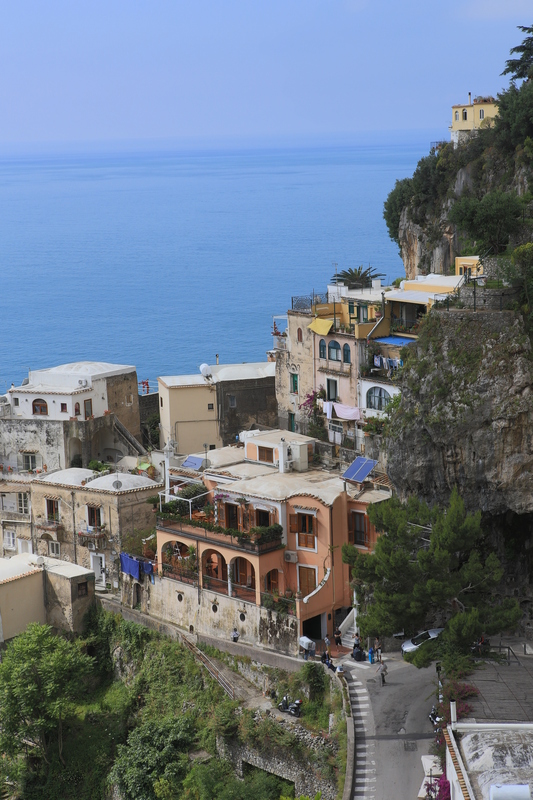 Ferries – In beside areas like the Amalfi coast, take a ferry to visit other local towns. This is a fast and sonic way to travel an area. Ferries are usually not expensive. Train – An in between option is to take the train. Most airports have easy access to trains that take you into the nearby city. 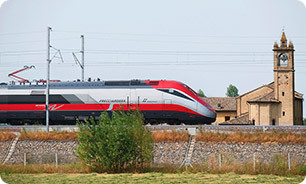 From any of Italy’s big cities you can board high-speed trains (Trenitalia) to any other big city in Europe. Trains are fast and efficient. Remember that your ticket must be validated before boarding the train unless you have an e-Ticket that says no validation necessary. Validation is sticking your ticket into a yellow validating machine at the end of tracks and getting it time stamped. From a large city you can transfer to local trains that go to almost all local towns. You can get to your destination or a nearby town easily. However you get around Italy, enjoy the ride. Look at Italy’s vast rugged countryside. The mountains are large and very rugged. Italy was formed by very violent volcano and earthquake events. It literally rose out of the sea. What was left is a very beautiful countryside. Italy is one of the most visited countries on Earth. Go and see why! Explore Italy and be romantic. Tomorrow we ill look at booking your airfare and pricing. A one way (down) road – which is the only road in town. 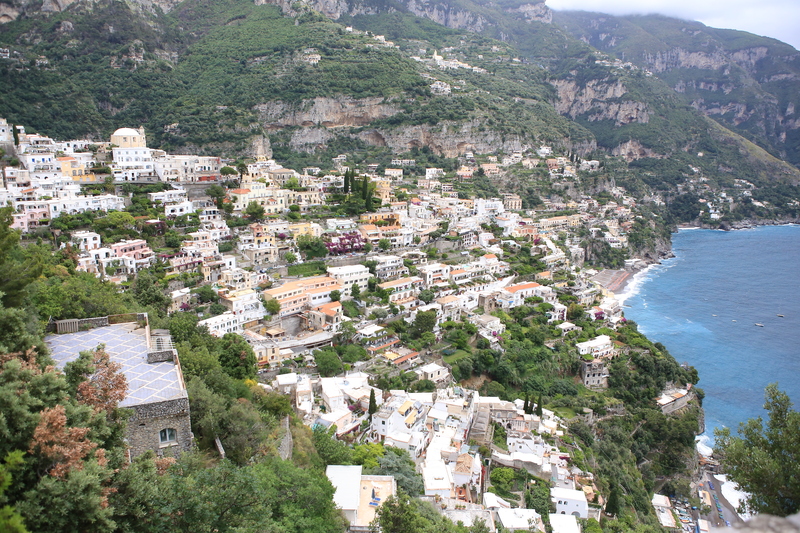 It starts up high at the Amalfi Coast Road and winds down through the center of town and ends at the Amalfi Coast Road where it leaves Positano. 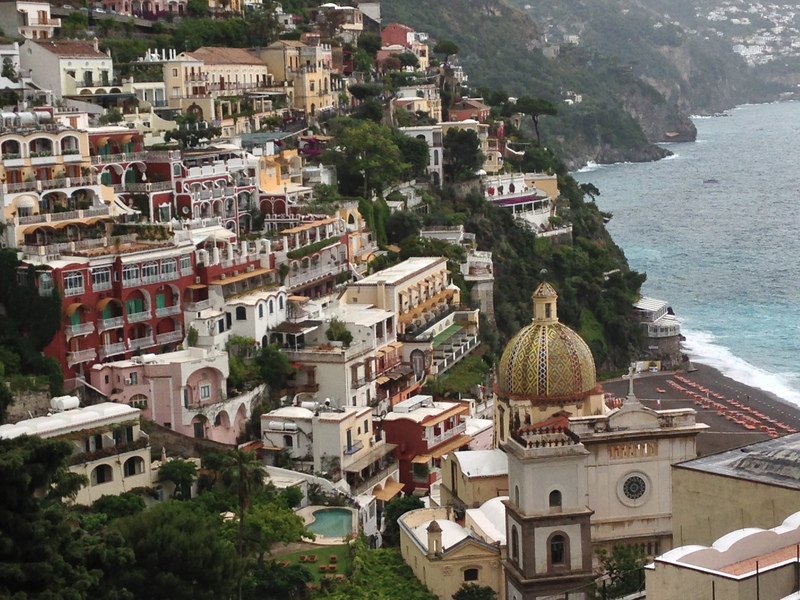 Positano has a population of only about 4,000 people. There are no trains here so you will need a car or bus to get here. There are busses from Sorrento going East and Salerno going West. You can fly into Naples to the north-west or Salerno to the East. The land here is steep mountains starting at the sea and continuing up. It is amazing that a city was built on these steep hills. You can take steps up and down everywhere. From the top to the beach is about a thousand steps. You can also walk the one-way road up or down. It is steep but very walkable. You will pass hotels, restaurants, great little shops and bars. There is a local bus that is inexpensive. 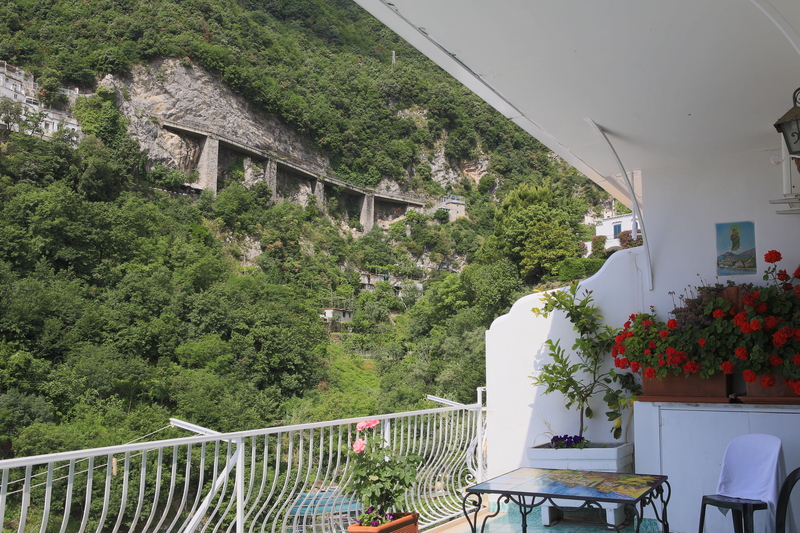 It starts on the one-way road in the center and goes out to the Amalfi Coast Road. 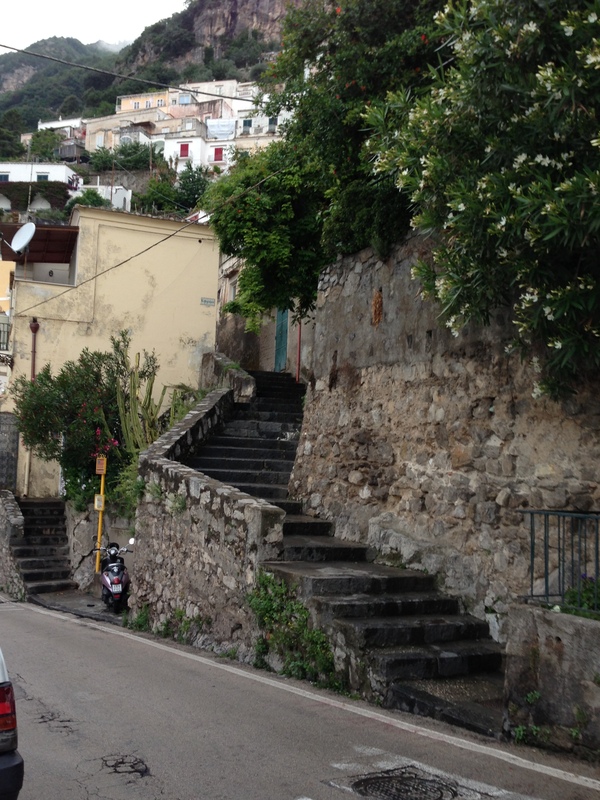 It turns left and climbs up the hill to the top of Positano. It then turns left onto the beginning of the one-way road and continues back down to the center. There are many ferries that leave from the big beach to Naples, Capri, Sorrento, Amalfi, Salerno and many really small cities in between. 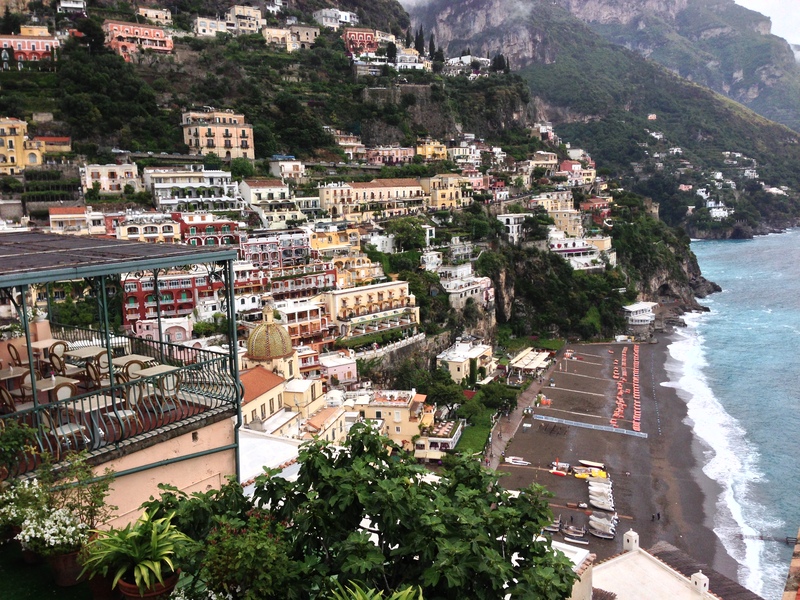 Positano is very romantic. A must stop for all our romantic readers. You can find great food, gelato and wine. The hotels and B&Bs have great views. Enjoy! We also like Milan because it is such a fashion capital. If you have extra time on one of these trips head to nearby smaller towns. If you have already seen these major attractions, plan a trip to seaport and mountain town. 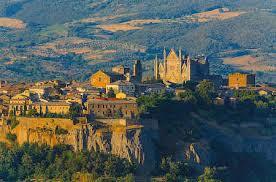 Orvieto – A town atop of bluff. It is magnificent and can easily be walked from one end to the other. As you approach the duomo, you are shocked! Here a magnificent huge cathedral exists in a piazza. Your first view is from the small streets leading to the piazza. From Rome you take a train north to Orvieto. As you exit the train you cross the street and take a funicular up the bluff to the city. The streets and people here are wonderful. The restaurants are magnificent. If you are driving, you must park at the bottom and walk up or take the funicular. Only some resident cars are permitted up into the city. Pompeii – Take a train or drive south just past Naples to Pompeii. It lies in the shadow of Mount Vesuvius. Pompeii is an ancient Etruscan (then Roman) city destroyed when Vesuvius erupted violently. The city is amazing. 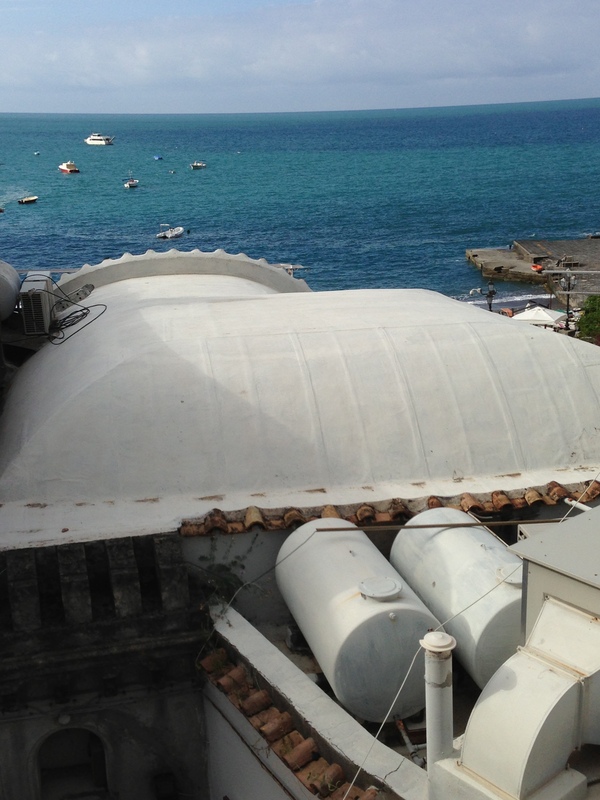 Only the wooden roofs are gone. The stone buildings still stand. Huge wealthy homes with courtyards and inside baths. You wouldn’t mind living in these today. They had running water and sewers. The knowledge they had is mind-boggling. We always look at where we plan to go and find small interesting towns nearby. Then we plan how far a drive it will be or if there is a good train service. Enjoy and explore Italy, it’s romantic!